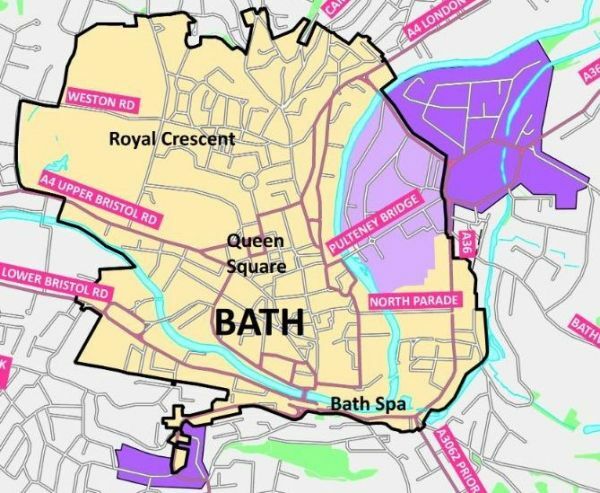 • The CAZ boundary will be expanded to include the Pulteney Estate area, the Bathwick Estate and Sydney Gardens areas, and the junction of Oldfield Road and Wellsway (including Oldfield Road). These extensions to the CAZ will be welcome to our members in these areas. The map shows the areas to be included in the CAZ. • FOBRA recommended addressing the forecast exceedances at Gay Street and Walcot Parade by means of traffic management, and this the Council now proposes to do. With these measures, the Council now believes that compliance can be achieved with a Class A-C CAZ (excluding private cars). • However, the selected traffic management measure is to introduce new traffic lights at Queen Square, at the junctions with the A367 Chapel Row/ Princes Street and at Queen Square Place. It seems quite possible that this would not deter traffic but actually result in stationary traffic backing up from the lights, leading to increased congestion and air pollution in the area. We would have preferred action to reduce traffic volumes by closing 2 or 3 sides of Queen Square. The Council will keep air pollution levels here under review, and may need to consider alternative measures if the proposed measures do not have the desired result. • Although cars will not be included in the CAZ, the Council proposes a scrappage scheme for older, non-compliant, cars so as to encourage their replacement. • Charges for higher emission vehicles to drive in the zone remain as for the original proposal: £100 for buses, coaches and HGVs and £9 for LGVs/vans, private hire vehicles and taxis. There will be no concessionary period for taxis. • The Council wants to promote Park-and-Ride, but does not currently plan to reduce visitor parking in the centre to encourage this. 2. The West of England Combined Authority (WECA) has issued a consultation draft of the Joint local Transport Plan (JLTP) 4, the new statutory transport plan for our area. The consultation closes on 20 March. A draft set of FoBRA comments has been circulated. 4. B&NES is to introduce electric bike hire in Bath this summer. The existing Nextbike stations ceased operation last month.